Removes all instances of ENB, FXAA, ReShade and SweetFX from a given directory and enables you to save your configs to 50 (or more) slots. These saved configs can then be loaded back in with a single click, hassle free. - Single loading of dxd11.dll files from saved slots now carry across a d3dcompiler_46e.dll if one is not present. - Added new single deletion feature: Double click the filename in the detected files list to remove it. - Application data lookups now configured to the full Nexus site changeover. - Moved the 'Number of Downloads' label to the Endorsements tooltip. - Added a 'Show Changelog' feature for future updates. - Added a message window for when things go wrong, I can alert you. - Fixed the 'Delete all configs from Set' right click option not correctly removing the highlighted active config from the top slot. - Optimised 'Delete all configs from Set' action count. - When saving new configs, focus automatically goes to the relevant textbox. I got tired of having to look for the individual files used for ENB, FXAA, ReShade and SweetFX modifiers when testing them out, so I decided to write a small program to find and delete all traces of all versions from a given directory. It also gives you 50+ slots to save your configs to. These saved configs can then be loaded back into your chosen game directory with a click of a button, hassle free! You can even add your own file and folder names to the list this program uses, letting it use those strangely named ENB config files some mod authors use! If you see a file in your game directory that isn't being detected, just drag that file directly onto the remover and the filename will get added to the management list. 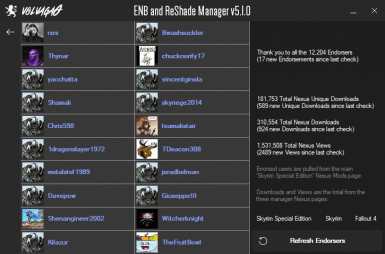 Run "ENB and ReShade Manager.exe" from anywhere on your PC. Make sure the path points to your Skyrim install directory, if not make it do so. 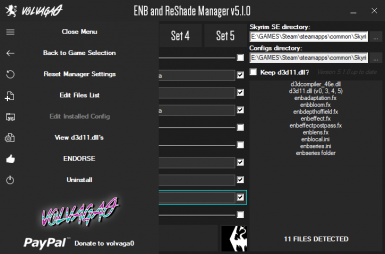 It will delete all instances of ENB, FXAA, ReShade and SweetFX from the selected directory. It will display what has been deleted if anything has at all. You can then install any other configs you may have without having to worry about files conflicting. WHY AREN'T ALL MY ENB FILES BEING DETECTED? Some ENB configurations come with there own custom lot of files that it pulls from. 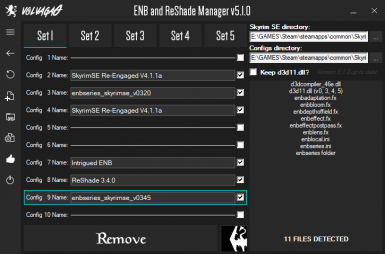 If you have any ENB files that aren't being picked up by this tool, select them from your game directory in your file explorer and click and drag them onto the detected files area of the manager. The manager will write the dropped file names to the files list automatically, any duplicate file names and you will be notified they already exist in the files list. This will work for single files in the root game folder only (or where you have the game directory set to), This doesn't work with folders yet. Folder names will need to be written manually by opening the files list and writing a new line. This is a one-time setup event that won't need to be done every single time. Once you have those filenames in there, that's it! You will now be able to remove, save and load those files using the manager. - Fixed 'Endorse' link linking to the wrong page (game mode specific). - Fixed 'Go to mod page' button linking to the wrong page (game mode specific). - Fixed 'Remove' button not de-selecting the last highlighted installed configuration. - The last config that was saved or loaded will be highlighted to display the currently installed configuration. - Many other misc changes. - Completely overhauled the way the app looks up files for use. - Added custom files list for adding new file and folder names for the app to use. - Added a new files button that opens the files list. - Added ability to Drag & Drop files onto the app to automatically add file types to the files list. 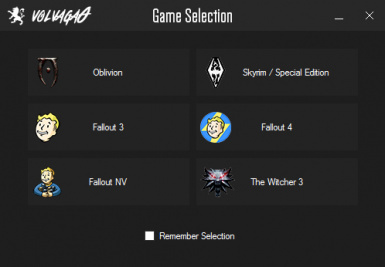 - Added ability to select the location of your 'SkyrimPrefs.ini'. - Added ability to completely 'uninstall' the app by right clicking the black and white main image. - Fixed feedback textbox to accurately list which files are being detected. - Fixed saved config detection checkboxes not being ticked when a config was saved there. - Added ability to delete a whole set of configs by right clicking a set number button. - Loading in configs will now automatically delete any previously installed configs first.